It is difficult to understand all the different Aurelia models, and which changes happened with which model. There were changes in displacement, manifolds, heads, rear suspensions, and transaxle design. 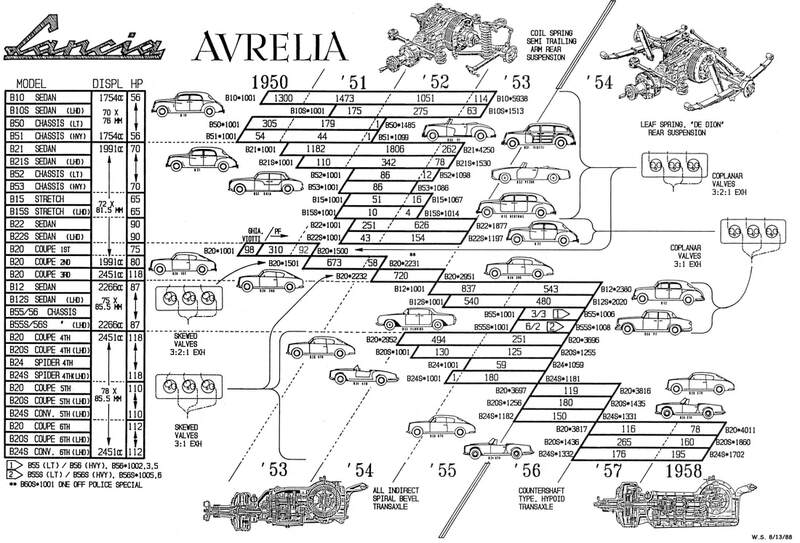 In 1988, Bill Stebbins, a Boeing engineer and Lancia fan, put together a superb diagram collating all the information in one place. He included all the production numbers, and even today, is largely accurate. Its a fine piece of work, worthy of study, and our long-term appreciation. Additional information can be found in the Bernabò history, Lancia Aurelia GT, only in Italian, the best collection of information. But to see all the differences in one place, nothing beats the Stebbins diagram.